Audials One is the perfect solution to record Netflix streaming video and convert it to play on your PC, smartphone or iPod in one easy step. The Netflix streaming process won’t allow any software to capture the video directly but you can capture it as it plays on your screen. Just play the entire video you want to capture without interruptions, and it records it and converts it to any format you need. The quality of the recorded file is exactly the same as the video shown on your monitor! See our short video showing exactly how quick and easy it is to record Netflix. Download the demo here . Audials One can record movies watched through any internet streaming site. Now you don’t need to worry about your favorite movies disappearing from online video sources or suddenly requiring a subscription fee. Record clips, capture videos and streaming HD movies from video-on-demand websites while they play on your screen. Audials One includes a universal video and audio converter for every file format for PCs, cell phones, iPods, iPads, iPhones as well as other portable devices. And, you can even easily create cell phone ring tones. The “PerfectVideo” Quality Guarantee takes care of problems with copy protection and file formats. It handles problems arising from DRM copy protection on music, movie, and audio book files quickly and reliably. Keep Your Video and Audio Collection Clean – Audials One lets you perfect your collection of digital media with id3 tags, cover images, song lyrics, and it helps keep your collection organized. It also includes a media player for you to enjoy your collection. Audials One has received nearly 600 awards for excellence from leading computer publications since 2006. It’s one of the top-selling products of its kind. Record Hulu™ videos and YouTube™ web clips. Capture streaming video from any on demand HD movie website. Audials One records from thousands of video entertainment sites. It’s the undisputed champion of recording digital entertainment for free and gives you every file in the format you want. Audials One converts your video library to the right file format for all your devices. Simply specify the device: PC, cell phone, iPod, PDA, PSP, DVD, CD, etc., and it will convert it to the right file format and resolution. Audials One effortlessly resolves file formatting problems and problems with DRM copy protection with the PerfectVideo quality guarantee. Today everyone is getting their movies online through Video-on-demand (Vod) websites. New online video stores are popping up all the time offering a wide range of titles for every taste. Audials One Makes It Easy to Record Netflix. Simply rent a movie online, watch it, and Audials One can record it in any format for every device giving you the chance to watch it at home or on the go anytime you want. Perfected through years of development and customer feedback, Audials’ innovative re-recording technology has been extended and enhanced to work with video files. As a result, it can create a completely legal, unprotected, high-quality copy of any DVD-based movie. It also frees music files from copy protection by re-recording CDs at the highest possible quality level to create completely legal, unprotected copies. Other programs can make recordings but they stop there. Only Audials One also finds the videos and podcasts that you want. Others also have video search engines, but only Audials One provides you with clips and videos in the correct file format automatically for every device. There’s other software that converts files, but Audials One records entire movies and songs while you watch them. It really is an all-in-one solution and an amazing piece of software. Supports a wide range of video devices including the most popular: PC, cell phone, smartphones, iPods, iPhones, Xbox, PS3, PSP, and more! Fix file formatting & copy protection problems. Includes a file organizer and converter. 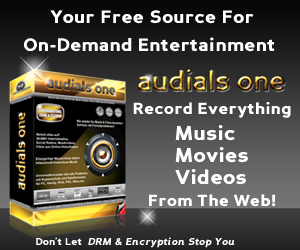 Audials One is your solution to DRM copy protection problems with music, video, and movie files. It’s been effortlessly and legally rerecording private copies since 2004. Audials One guarantees perfect quality by using quality control features while rerecording video files with copy protection. Films and videos are recorded frame by frame and are saved by a one of a kind process that depends on your computer’s capacities. The PerfectVideo quality guarantee applies to all DRM formats for videos that can be edited by Audials One. It makes rerecording problems stemming from copy protection a thing of the past and allows you to enjoy your customized entertainment on every device. Use it when the music, audio books, video, music video or movie format cannot be played on your devices. The universal converter converts the files into a compatible file format for every device and doesn’t sacrifice quality. Audials One provides you with a complete music collection and ensures that you have all the important artist and song information when playing your customized music. All the id3-tags and cover art are added to your collection automatically. You can also use the Editor to make changes manually. 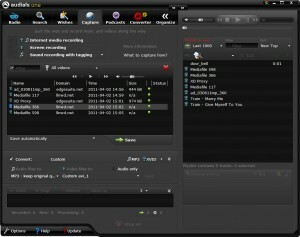 Audials One delivers tons of music, films and videos straight to your computer and assists you in managing these files as well. 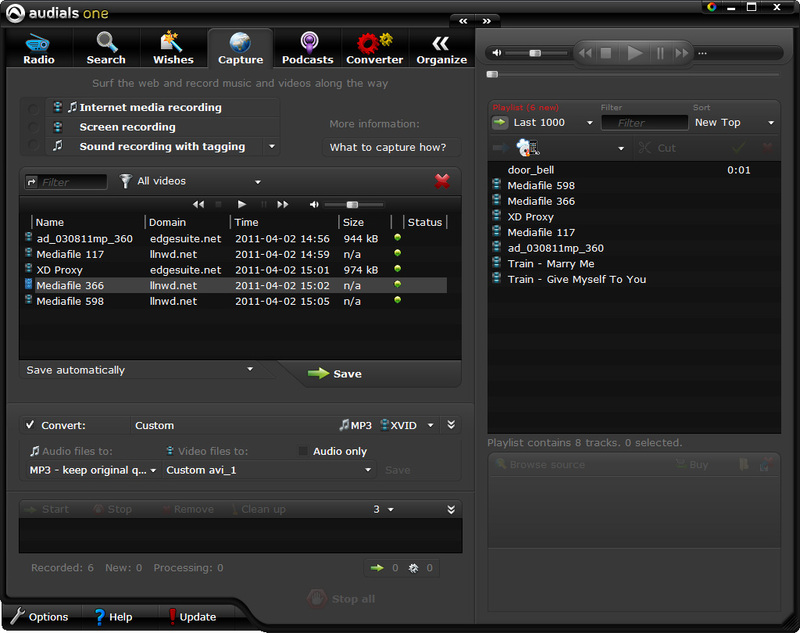 It also has an extra feature allowing you to easily manage and sort media via folders. Selected files can be burned to CD/DVD or transferred to a portable device, such as a cell phone, iPod, mp3 player or multimedia player. You can even create your own cell phone ring tones quick and easily. And customizable video output profiles. Download the free demo .